To appreciate the need for forest plantations in arid zones, the roles played by these plantations must be defined. Quite often, there are a number of roles (such as fuelwood or fodder production) which, through careful planning, can be combined to achieve multiple benefits. This section of the manual describes the techniques for the establishment and management of forest plantations in arid zones. - Climate - temperature, rainfall (amount and distribution), relative humidity, and wind. - Soil - depth of soil and its capacity to retain moisture, texture, structure, parent material, pH, degree of compaction, and drainage. - Topography - important for its modifying effects on both climate and soil. - Vegetation - composition and ecological characteristics of natural and (when present) introduced vegetation. 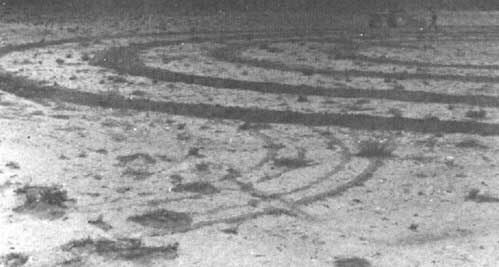 On areas which have not been degraded by man, the vegetation can provide an indication of the site. Unfortunately, over much of the arid world, the vegetation has been so disturbed that it is no longer a reliable indicator of potential planting sites; in these situations, site selection should be based on soil surveys. - Other biotic factors - past history and present land use influences on the site, including fire, domestic livestock and wild animals, insects and diseases. - Watertable levels - a knowledge of the depth and variation of the watertable levels in the wet and dry seasons is valuable and can be crucial in determining the tree and shrub species that can be grown. Watertable levels can be estimated from observations in wells or by borings made for this purpose. - Availability of supplementary water sources - ponds, lakes, streams, and other water sources. - The availability of labour. - Motivation of the local population. - The distance of the forest plantation to the market and consumer centers. - Land ownership and tenure. Where to plant is generally a collective decision made by policy makers, foresters, and the planting crews, based on information obtained in the site reconnaissance. The key is to select the site that, when planted, will lead to the establishment of a successful forest plantation. Often, the choice of the planting site is limited to lands which are not suited for agriculture or livestock production; when this is the case, the site reconnaissance information gains importance. The boundaries of the planting site, once the area has been chosen, should be marked with boundary posts. When there is a danger of trespassing and damage by grazing animals, a boundary fence should be established. Fencing is costly and, therefore, should only be built when other means of protection are not effective. Once a forest plantation is well established and the trees are sufficiently tall, the fences can be removed and reused at another planting site. When roads and other passageways traverse the planting site, they should also be contained with fences. In many instances, tree and shrub planting is undertaken to protect fragile sites from degradation. However, in some situations, the fragile sites should not be planted; it may be better not to disturb the soil in these areas. Where gullies have been severely degraded by erosion, protective measures other than the planting of vegetation (such as building small checkdams) may be necessary. When the best possible information has been collected on the characteristics of the site to be planted, the next step is the selection of the tree or shrub species to plant. The aim is to choose species which are suited to the site, will remain healthy throughout the anticipated rotation, will produce acceptable growth and yield, and will meet the objectives of the plantation (fuelwood production, protection, etc.). For a successful planting, performance data may have to be extrapolated from one locality to another. Results from a locality where a tree or shrub species is growing (either naturally or as an exotic) strictly apply only to that locality; their application in another locality involves the assumption of site comparability, an assumption which may or may not be justified. When reliable information shows a close similarity between the site to be planted and that on which the species is already successful, it is generally possible to proceed to large-scale planting with confidence. In practice, the above data are seldom available, and planting on the new site becomes (in effect) experimental and should proceed on a small scale; when this occurs, detailed performance records should be maintained throughout the experimental planting period. The selection of tree or shrub species through the use of analogous climates is important as a first step; but this must be amplified by an evaluation of localized factors which can be more important (for example, soil, slope, and biotic factors). However, the ability to match closely a planting site and a natural habitat may not preclude the need for species trials, since climatological or ecological matching may not reveal the adaptability of a species. It cannot be emphasized too strongly that, without such trials, the choice of tree or shrub species is (in most cases) a risky business. 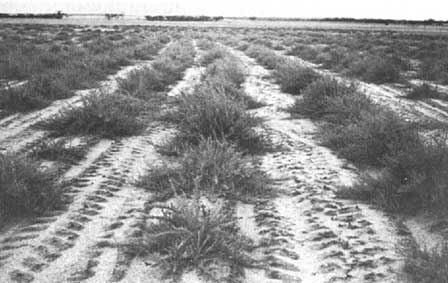 Since planting in arid environments is normally an expensive undertaking, large-scale failures which result from the wrong choice of species or failure to test them can prove costly. When the tree or shrub seedlings arrive from the nursery, the site should have been prepared to ensure that planting can proceed without delay. Arid zone conditions frequently demand more intensive and thorough site preparation than is necessary for planting programmes in moister climates. - Remove competing vegetation from the site. - Create conditions that will enable the soil to catch and absorb as much rainfall as possible. Surface runoff should be reduced to increase the moisture in the soil. - Provide good rooting conditions for the planting, including a sufficient volume of rootable soil. Hardpans must be eliminated. - Create conditions where danger from fire and pests is minimized. Site preparation is directed toward giving the seedlings a good start with rapid early growth. In general, the methods used to achieve site preparation will vary with the type of vegetation, amount and distribution of rainfall, presence or absence of impermeable layers in the soil, the need for protection from desiccating winds, and scale of the planting operations. Additionally, the value of the tree or shrub crop to be grown is important in determining the amount of expense that may be justified in plantation establishment. In general, preparation of the site by hand is possible and economical only for relatively small-scale projects, where the labour of clearing the competing vegetation and working the soil is not too time-consuming. Under certain conditions, animal-drawn ploughs and harrows can also be economical for small-scale operations. Mechanical soil preparation, used increasingly in large-scale planting programmes, has become a common practice in many areas; often, this is because the supply of labour and the time available for ground preparation are too limited to permit large-scale projects to be undertaken by hand. Some operations, such as deep subsoiling and the breaking up of hardpans, can only be done by machines. Whatever method of site preparation is used, a planting pit (of an appropriate size) should be prepared. The objective of creating planting pits is to aerate and loosen the soil in which the plants will grow. When these planting pits are prepared, they should not be left empty with the excavated soil lying on the ground, but refilled immediately, otherwise sun and wind will dry out the soil completely (Figure 4.1 A & B). Figure 4.1A Planting holes 0.4 m x 0.4 m x 0.4 m at a density of 3 m x 3 m.
Soil preparation can be carried out in patches, strips, or by complete cultivation. Complete cultivation is necessary for tree and shrub species which are intolerant of competition from grass, forte, and woody growth (such as most eucalyptus species). Sometimes, spot preparation may be sufficient, but the spots should be large (for example, 1 to 1.5 meters in diameter). Also, it is important that the work be done thoroughly. Other methods of soil preparation by hand are the ash-bed method, tie-ridging, contour trenching and terracing, and the "steppe" method. The ash-bed technique consists of piling the debris from harvesting or clearing the land into long lines or stacks. After drying, the debris is burned and vegetation is planted in the ash patches. Sometimes, the lines or stacks of debris are covered with "clods" to obtain a more intense heat when burning. Advantages of this method are that the burning kills the competing vegetation, the area remains free of this vegetation for an appreciable period, and the ash provides a useful fertilizer for the planted trees or shrubs. 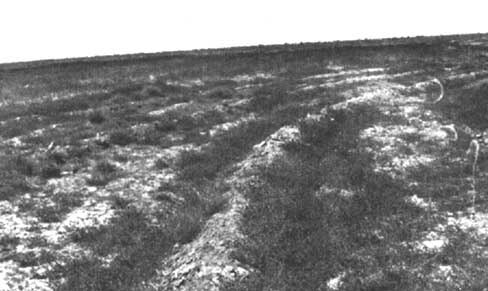 The tie-ridging technique involves the cultivation of the entire area and the establishment of ridges at specified intervals. The main ridges, aligned along the contours, are joined by smaller ridges at right-angles to create a series of more-or-less square basins which retain rainwater and prevent erosion. The ridges are generally 3 meters apart. The trees and shrubs are planted on the ridges. This method is suitable for flat or gently sloping ground and can be combined with an agricultural crop during the initial years of plantation establishment (Figures 4.2 and 4.3). Trenching techniques along the contours are used in site preparation in hilly country. The trenches can be continuous (Figure 4.4), divided by cross banks, or consist of short discontinuous lengths (Figure 4.5), arranged so that the gaps between the trenches in one row are opposite those in the next row; in this latter instance, runoff from rainfall is caught. Trenches are formed manually or mechanically. On gently sloping ground, the herring-bone technique can be used (Figure 4.6). Terraces, which are wider and flatter than trenches, can be either manually or mechanically formed on the side of a hill by digging soil from the uphill side and depositing it on the downhill side. Usually, the bottom of the terrace is made to slope into the hillside. The purpose of terracing is to retard and collect water runoff between the terraces. Because of the improved soil moisture conditions, the terrace provides improved conditions for plant growth. Planting is done on the ridge of soil, at the base of the ridge, or in patches at the bottom of the trench, according to moisture conditions. Terraces are used widely on moderate to severe slopes. Terraces can be 2 to 3 meters or several hundred meters in length (Figure 4.7). If short, they can be staggered on the hillside wherever convenient. Sometimes, crescent-shaped terraces are constructed with the two tips of the crescent pointing uphill. 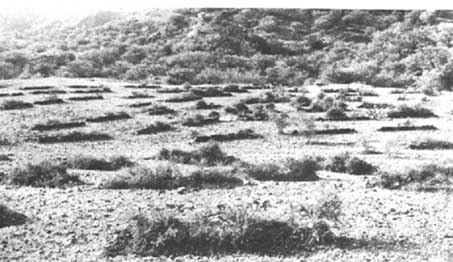 Figure 4.4 2 year old Acacia modesta planted in continuous trenches. 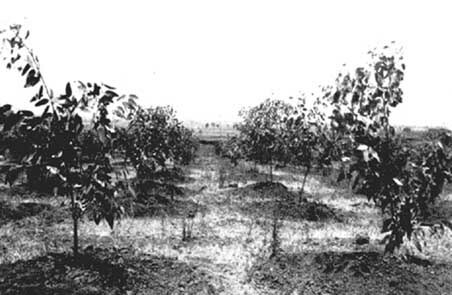 Figure 4.5 Acacia modesta and Acacia nilotica planted in discontinuous trenches. Figure 4.6 Herring-bone technique for soil preparation. Figure 4.7 Soil preparation technique on steep slopes. The "steppe method of site preparation is designed to promote growth of trees and shrubs in extremely dry areas. In this method, the surface of the soil is modified by breaking-up and stirring the deep layers of the soil with rooters, rippers, or large discs, and then building widely-spaced, parallel ridges following the contour. Ridges are built with the topsoil, and trees or shrubs are planted on the lower half of the ridges facing the slope; here, the depth of moist soil is greatest, due to accumulation of water after rain. The purpose of the "steppe" method is to maintain a reserve of moisture in the deep layers of the soil. Spacing between ridges is greater with lower rainfall, as the catchment area between the ridges is increased. The planting season generally coincides with the rainy season; usually, planting is started as soon as a specified quantity of rain has fallen. This amount of precipitation must be judged on the basis of local knowledge. Planting can also be initiated when the soil is wet to a specified depth (approximately 20 centimeters). A common mistake is to start planting too soon. On the other hand, if planting is started too late, it may be difficult to complete a large planting programme in the scheduled time, and the plants will lose the maximum benefit of rains after planting; this can be a serious matter where the rainfall is low and erratic. Planting of containerized stock is usually done in holes that are large enough to take the containers or the root-balls when the plants are removed from the containers. It is essential that the surrounding soil is firmed down around the plant immediately after planting to avoid the formation of air gaps which can lead to root desiccation. A good practice for the preparation of planting holes is to surround the planting pit with a small ridge (15 to 20 centimeters in height) of soil, to obtain a small basin (about 80 centimeters in diameter); this is especially helpful when the plants are watered individually after planting. The small prepared basin can also be covered with a plastic sheet (held in place on the ground with stones or earth), with an opening in the center for the plant, as illustrated in Figure 4.8. The plastic sheet impedes evaporation of ground water from the planting hole; also, dew collects on its surface and runs to the central opening of the sheet to irrigate the roots. Through conservation of soil moisture, plastic films facilitate more rapid establishment and growth of trees and shrubs during the initial, and most critical years. Another benefit of opaque plastic films is that they inhibit weed growth by reducing light penetration. With the suppression of weeds in the immediate vicinity of the plants, labour also can be saved. Figure 4.8 A planting hole with plastic apron to impede evaporation of ground water. A threat to newly-planted trees in arid zones is the high rate of transpiration. Unless the plants can establish themselves quickly and compensate for the transpiration by taking water through their root systems, they will wilt soon after planting. This explains why even a single watering immediately after planting can be useful. In general, containerized seedlings have a distinct advantage over barerooted seedlings, in that the earthball surrounding the roots provides protection during transport and enables the plant to establish itself quickly and easily. The restriction of lateral root extension, a result of using containers, can cause root malformation, coiling, and spiralling (Figure 4.9). In extreme cases, the coiling can lead to strangulation of the roots and the death of the plant (Figure 4.10). In other situations, it may reduce wind-firmness or lead to stunted growth. Unfortunately, the symptoms may not become apparent until 4 to 5 years after planting. To reduce the damage of root malformation in containerized plants, a common practice is to remove the container from the soil cylinder before planting and make two or three vertical incisions to a depth of one centimeter with a knife to cut "strangler" roots. As a further precaution, the bottom 0.5 to 1 centimeter of the soil cylinder can be sliced off. Care must be used to ensure that the soil does not disintegrate and expose the roots to desiccation.